Many birders chafe at any species labeled "invasive" or nonnative. 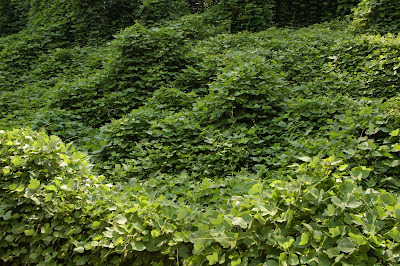 We point to House Sparrows or kudzu (below) as species that compete with natives, often to the detriment of the latter. We often think of the invasives as out-of-control marauders that run rampant after finding new territories to exploit. "There is this assumption that when plants invade a new area that they become much more abundant in the new area than they were in the native areas," said Harpole. "It turns out that, on average, they aren't any more abundant away from home than they are at home." The 70 researchers at 65 sites around the globe found that a "rule of 10s" can apply to invasive species, Harpole said. "Of, say, 100 plants that arrive in a new area, only about 10 percent of those will survive without being in a greenhouse or some other controlled area," he said. "Of those 10 that can survive, only about 10 percent of those really cause problems. "When you think about all the species we've brought over from other areas, relatively few have become serious pest species. The problem is we've brought over so many that quite a few have become major problems and they get a lot of attention." Does this make any logical sense to you at all? Virtually by definition they're "more troublesome" when they affect other organisms not evolved to co-exist with them. A very strange way of thinking about these problems! I really love the wild bird it looks like a falcon and i love to keep this bird at my home.